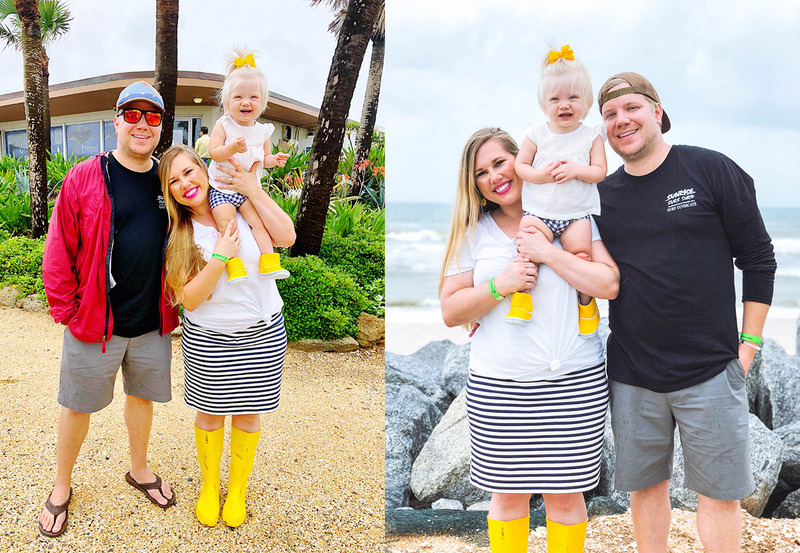 We were recently invited to a VIP event at Marineland with Fun4FirstCoastKids and the North Florida Influencers. I’d never been there before and honestly hadn’t heard much about it, so I was excited to check it out and learn more about marine life on the East Coast. I also knew Daisy would love watching the dolphins, and I was right! 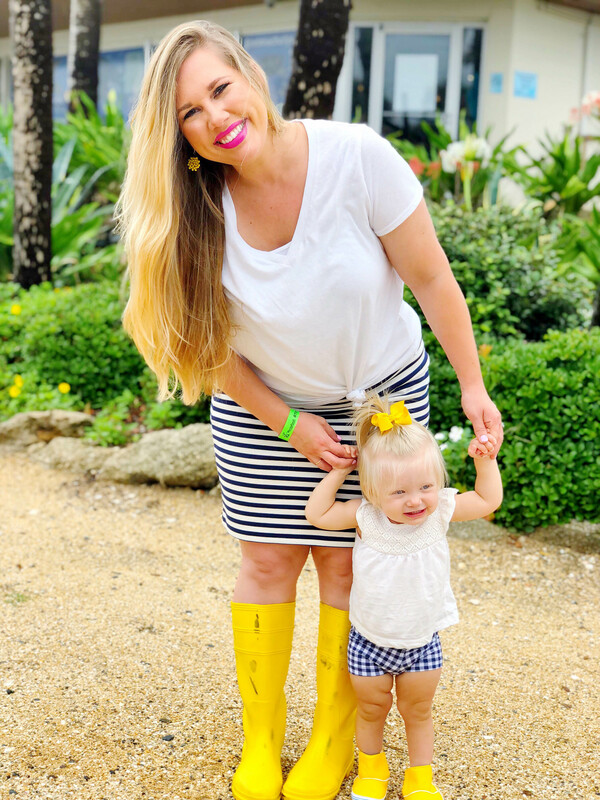 Because I didn’t know much about Marineland before visiting, I wanted to share a little about our experience and about the venue itself, in case you’re not familiar with it and are looking for some family-friendly fun this Summer. Hopefully this post will give you a little peek at what you can expect, how to prepare, and some must-do’s while there! Marineland is home to several dolphins who are living their best life, and was founded to “foster the preservation and protection of marine life.” Their mission is to educate the public about marine life and preservation, and to “inspire visitors to value and respect marine mammals and their environment” while providing research. It’s seriously such a cool place to get up close to dolphins and experience all they have to offer. They sure do bring an instant smile to your face! Back in the day, when Jacksonville was “Hollywood” before there was Hollywood, tons of classic black-and-white films were filmed in the city. Marineland was a famous film studio, and “Creature from the Black Lagoon” was one of the may movies filmed there. They haven’t collected any dolphins from the wild in over 40 years. Dolphins only shut down half of their brain when they sleep. Keeping the other half alert allows them to see, continue to swim and be alert. If you do the Behind the Seas tour, you get to see some of the film studio along with an underwater viewing area. The dolphins are as aware of you being there as you are of them, and they’ll come to the window and flirt with you. It’s so cute! We even got to see a baby dolphin nursing! 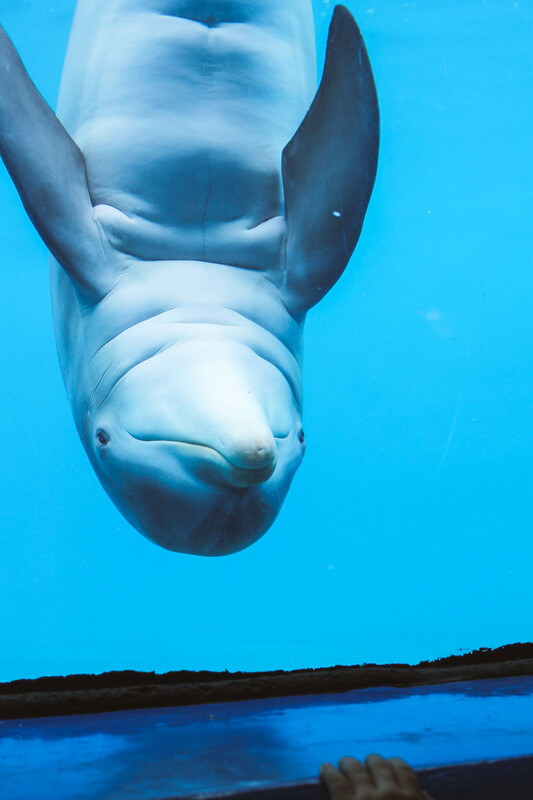 Marineland is Celebrating their 80th anniversary this June! Check their website to see when they have free days and special events to celebrate. 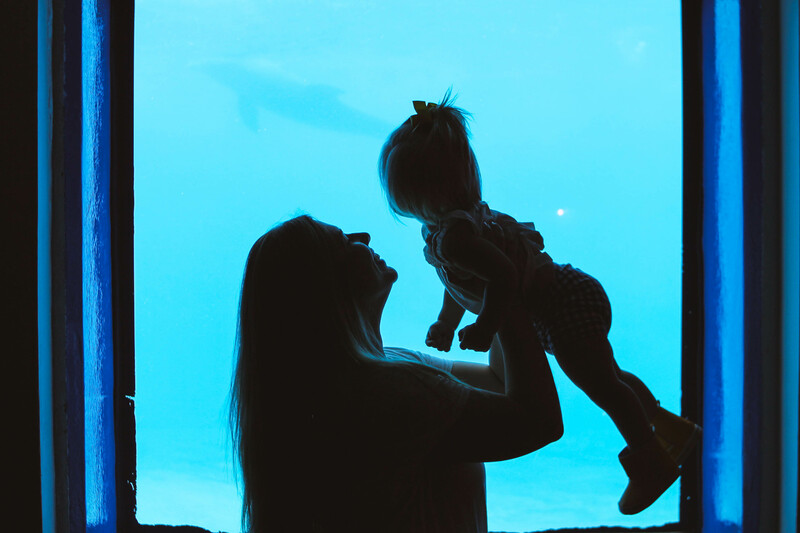 You can see some highlights through my pictures from our afternoon at Marineland, but I’ll address a few other topics and questions to help make you a little more prepared. 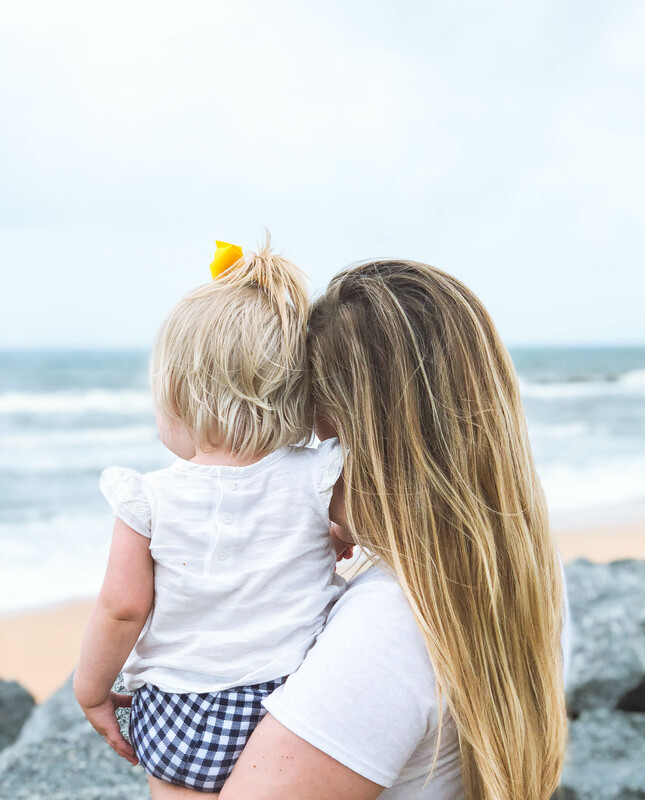 So if you’re thinking about a trip to St. Augustine and looking for some family fun, keep reading! We arrived at Marineland at 2 p.m. to meet up with our group. While waiting, we explored the outdoor facilities and saw the giant sea turtle and tiger shark, and read all the neat facts about marine life. The kids loved looking through the windows into the water! 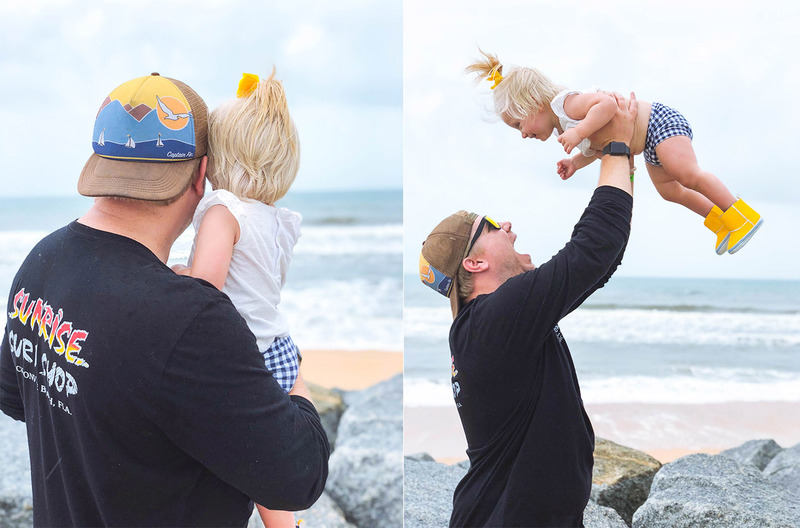 Once our group had arrived, we walked along the gorgeous ocean view to the dolphins, where we learned about the beautiful mammals and saw them perform a few tricks. I forgot how smart dolphins are! They knew to come to the window when the trainer put their hand on the glass, they can jump and twirl in tandem, and even paint a masterpiece with their noses. Seriously impressive. 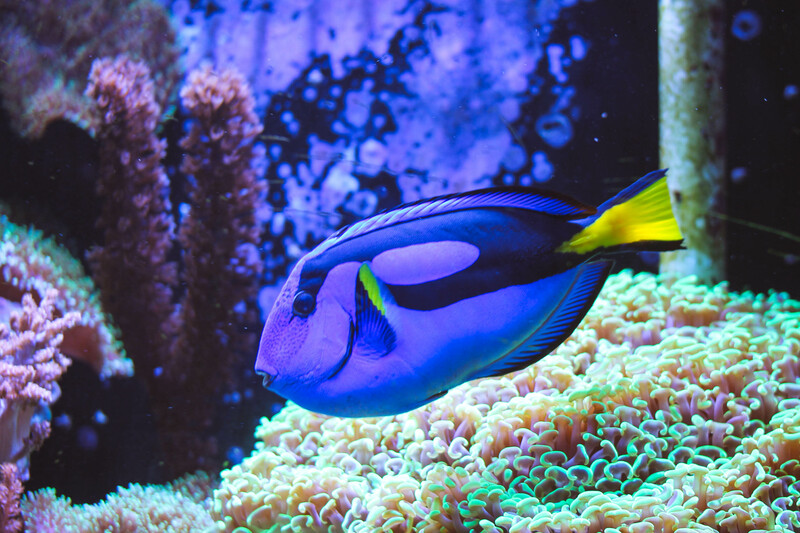 Next, we took off on the Behind the Seas tour to see all kinds of cool fish and sea creatures, and learn more about life under da sea. As part of the tour, we got to go underground and see the dolphins from an underwater viewing window, which was my favorite part of all. I highly recommend it! 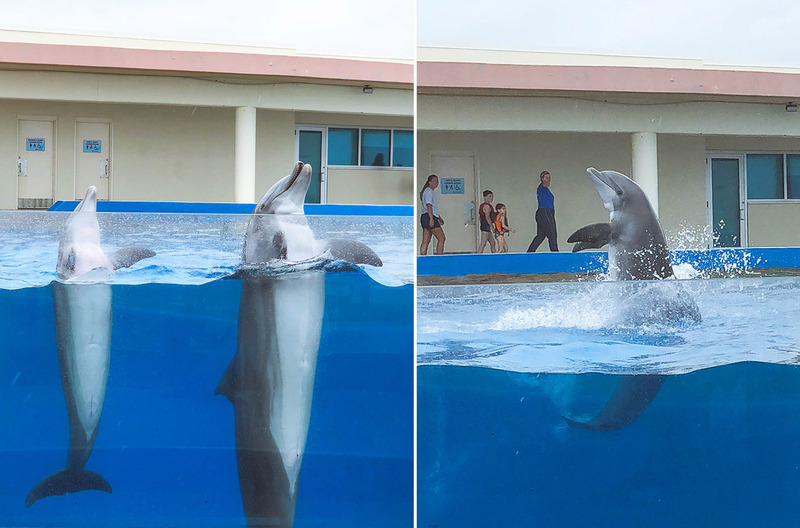 As we walked back up, we saw where the dolphins have “school,” where the injured dolphins receive physical therapy, and learn how they socialize them. Once our tour concluded, we headed back by the beach for a few photos, then down to enjoy some drinks and snacks. Our entire experience took about 2.5 hours. WHAT’S INCLUDED WITH ADMISSION + WHAT IS THERE TO DO? Your General Admission includes access to the outdoor facility and Neptune park. This includes the sea turtle, sand tiger shark and dolphin habitats. GA is $16.95 for adults, $11.95 for children over three, and $15.95 for seniors. 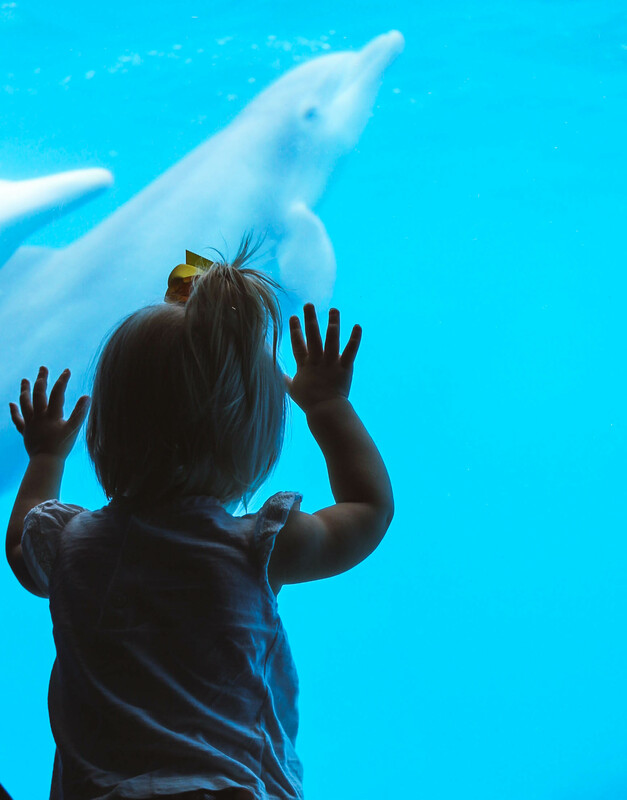 For additional fees, you can take part in all kinds of hands-on experiences, including Touch and Feed, Dolphin Designs (where the dolphins will paint you a masterpiece right in front of you! 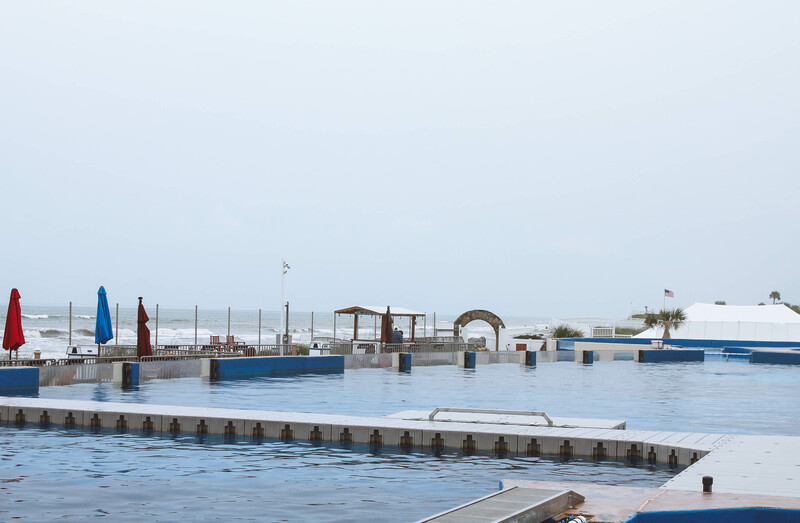 ), Discover Dolphins where you can get in the shallow water with the dolphins for a hands-on encounter, be a Trainer for a Day and do exactly as the trainers do, and the Dolphin Immersion where you can swim alongside with the trainers and dolphins in deep and shallow waters. You can even have birthday parties, events and weddings there, and there are lots of volunteer opportunities. You can learn more about admission, programs and experiences HERE. They’re locating in Saint Augustine, FL, not too far from downtown. Make a day or weekend out of it! 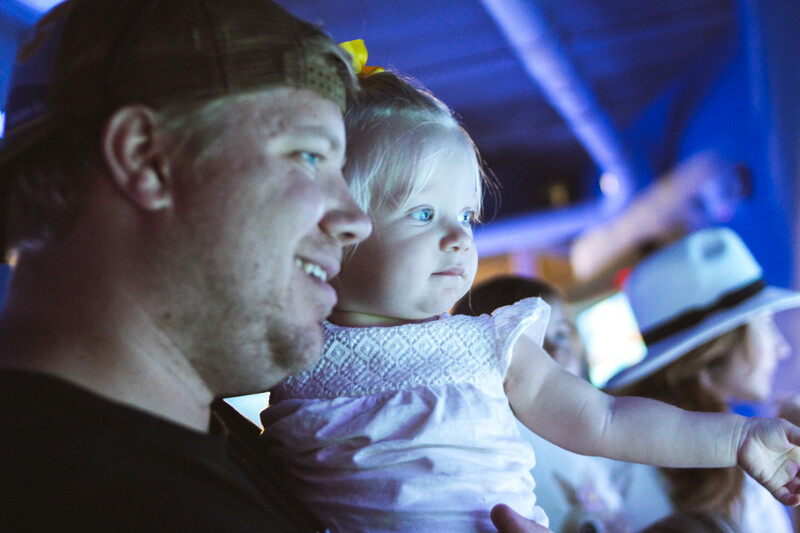 Where else can you find family-friendly educational entertainment with an oceanfront view?! Wear shoes that can get wet. Water shoes or sandals would be best, in my opinions. 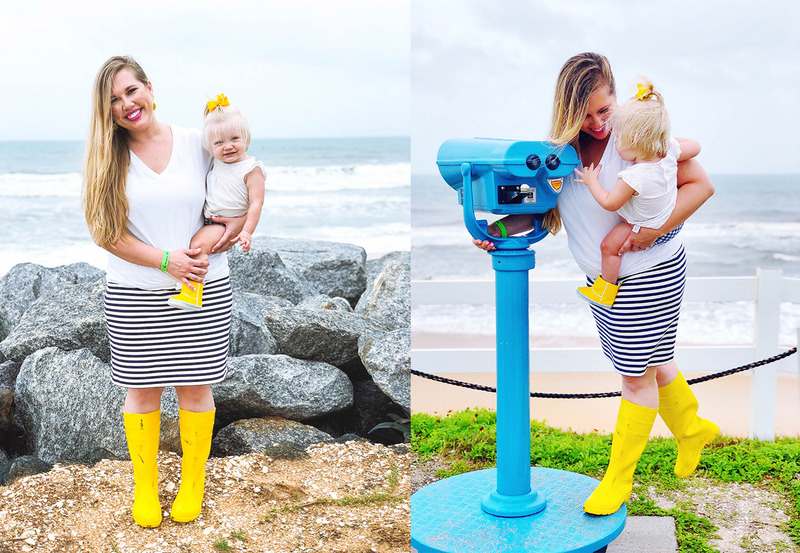 It was rainy when we went, so rain boots were a good call. You can take a lunch, snacks and drinks. They have a gift shop with a few snacks, but no restaurant. Come prepared and make it a fun day out. Parking is free – woohoo! Wear sunscreen. Must of the fun is outside, so be sure to protect your skin (especially those kiddos!) so no one burns. Balloons and straws are prohibited. They’re harmful to our water friends, so think twice before using them on the regular, and know that they won’t be allowed inside the facilities. They have a nice gift shop with a lot of cool keepsakes and souvenirs, so be sure to check it out! Some of the proceeds go back to education, so you’re making a difference when you shop. That should make the hubby happy :). Take a camera and charge your phone! So many cool photo/video opps and moments you’ll want to capture. Look ahead of time to see what upgrades you want to book, as many of them require reservations. Take a swim suite, towels and appropriate clothing if you’ll be participating in any of the water activities. Read the FAQs and website prior to your visit. Lots of good info there. Check age restrictions on specific experiences. Some have specific requirements. Take a few minutes to walk along the oceanfront path from the park area to the dolphin tanks. The view is spectacular, and you’re sure to spot a lot of wildlife on your own. I hope you enjoyed this post and found it helpful! Let me know if you make a visit to Marineland. I’d love to hear about your experience! Thank you for having us, Marineland. We cannot wait to come visit again soon! Click HERE to learn more about Marineland.